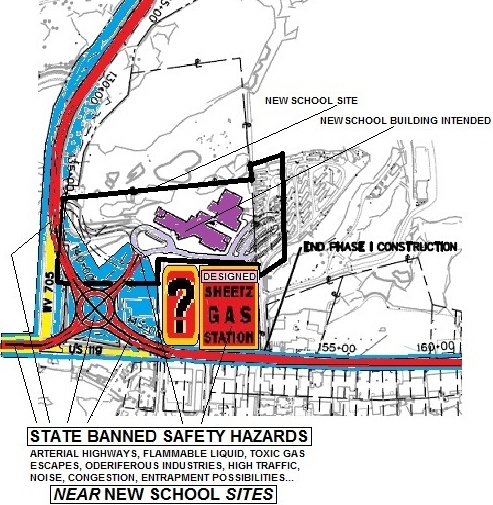 Today the Dominion Post reports that yesterday, at the Morgantown Traffic Commission meeting, Chairman Frank Gmeindl of the Morgantown Bicycle Board and Chairman Christiaan Abildso of the Morgantown Pedestrian Safety Board both “expressed concerns” about the DOH Mileground highway expansion plans which would build a 5-lane road with a continuous center turning lane rather than build a 4 lane divided highway with a median as was recommended by the Greater Morgantown Metropolitan Planning Organization. “From a safety factor, it’s clear that having a median is safer,” said Chairman Gmeindl. What a great place for a new school! It’s dangerous and wrong. Now and in the future. With 3 lanes, 4 lanes, or 5 lanes (or 6 or 7 lanes…). It’s dangerous and wrong with the current 3 lanes: north, south, and the continuous turning lane. It would be dangerous and wrong with 4 lanes and a median. And it would be perhaps most dangerous and wrong with the current 5 lane DOH plan. This Mileground arterial (US 119) by the intended Eastwood Elementary – Collision Elementary – will always be especially dangerous and wrongful, increasingly so, as the concerns above show, and given the state mandates, and coupled with studies predicting ever increasing traffic flows on the Mileground well over the current tens of thousands of cars per day today, especially in the intersection with WV 705 at the Eastwood site. And then there are the additional arterial highways link-in prioritized for the 705/119 Mileground vortex. Currently, the DOH plans for 5 lanes on the Mileground with a continuous center turning lane because the many businesses on the Mileground prefer it for doing business. Never mind the increased potential for deadly T-bone crashes that such a highway has as compared to a divided highway. Never mind the intended pre-kindergarten to fifth grade Eastwood elementary school at the Mileground intersection with WV 705. But both highway options (four or five lane) would be dangerous and wrong, as is the current highway. That’s why state mandate bars new school sites in West Virginia from being located near heavily traveled and arterial highways, let alone immediately adjacent to and engulfed by heavily traveled and arterial highways, as is and ever moreso would be the Eastwood site. Eastwood on the Mileground: ever more dangerous, ever more uncertain, ever more deadly. Eastwood is an accident waiting to happen, only worse. What it really is: official negligence, for which the county and state are at fault in being wholly irresponsible and wrong. « Think It’s Dangerous And Wrongful Now?